Baby Tag for Baby Girl Car Seat and Stroller, Do Not Touch Sign for Premies, Newborns and Infants - Sweeter Than a Cupcake - SPECIAL PRICE!! Worried about germs? Is keeping baby healthy your number one priority? Well, it should be, and if you're not the confrontational type (or simply have better things to do than repeat yourself), we can help! Our cute, highly-visible Don't Touch the Baby signs do all the work, so you don't have to utter a word!" 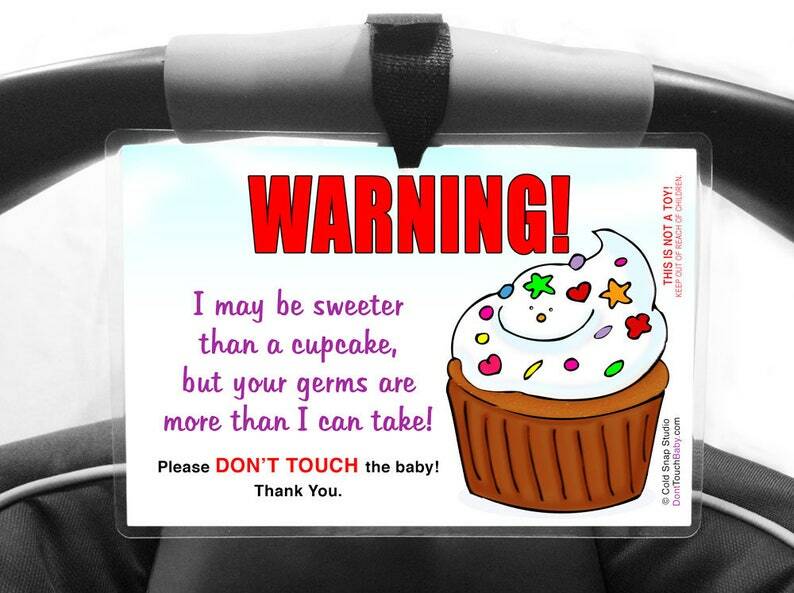 Sweeter Than a Cupcake" Do Not Touch the Baby signs! All of our signs, including text, photography and artwork are either copyright COLD SNAP STUDIO or copyrighted by a third party and used under license. They MAY NOT be reproduced in any manner, for any reason whatsoever, without our express written permission. Copyright violators will be subject to prosecution. To see our full copyright statement, please view our Policies. Thank you. Infant Car Seat Sign - Old English Sheepdog Puppy, Gender Neutral Don't Touch the Baby Tag, New Baby Gear - Special Price!!! Don't Touch the Baby Stroller Tag, Baby Shower Gifts - Funny Pink Boot for Infant & Preemie Girls - SPECIAL PRICE!!! Love this! It has caught attention when people approach and given me a way to kindly give the hint, don't touch the baby! Item Is as described. Fast shipping. So CUTE! Very happy to be giving this sign as a gift to a newborn who has yet to make his arrival! Baby Theo will have lots of admirers who will need gentle reminders about his health and safety. Never too early to turn someone into an Old English lover either in my opinion! Fast shipping! Great Etsy shop! Thank YOU! We accept Etsy gift cards, PayPal and credit card payments trough Etsy Direct Checkout! If you need to cancel an order, please do so as soon as possible. Within the US, some of our orders are shipped the same day they are received. If you cancel your order before we have shipped it, we will gladly issue a full refund. If the order has shipped, you may "refuse" the package once it arrives, and it will be sent back to us. Once we've received the refused package, we will issue a refund within 30 days, minus any shipping costs paid by us to ship the item. EXCHANGES: We exchange any items that are damaged on delivery. Please contact us within 3 days of delivery, along with photos of the damaged item(s) and mailer, and we'll be happy to set up a replacement of the same item. - Item(s) must be returned to us in NEW condition. - Buyer pays return shipping. - Sorry, any shipping fees paid to us to ship an order are nonrefundable. Please be sure to request a tracking number for your records and as proof of mailing — we are not responsible for returns lost in transit. Note: If the return is not due to our error, we will deduct our original shipping & handling costs from the refund amount if we shipped the item for free. Most items ship via USPS Standard mail in either a rigid mailer or bubble mailer (depending on your purchase(s)). You will receive a tracking number. The buyer is responsible for providing a valid shipping address. If the package is returned to us due to insufficient or wrong address, — the items returned to us are not personalized and the package is unopened — we will issue a refund, minus shipping (or minus any shipping and handling costs paid by us if the order shipped for free). If you provide an incorrect address and the tracking shows the package has been "delivered" at said address, please make arrangements to retrieve the package at the address you provided. Under no circumstances will a refund be issued, nor replacements be sent for a package delivered to an incorrect address provided at the time of order. International orders please allow up to 7 days to ship (our post office is a 20-mile drive away and we ship orders 1-2 times a week). Please allow 6-8 weeks for delivery. We ship via USPS First Class International mail. Our shipping fees cover shipping, handling & transport. ** Be sure to check your country's rules, regulations and polices on taxes, customs fees or CODs on purchases shipped to an international address. Buyers will be responsible for any customs fees, VAT, or taxes. SIGNS: ALL of our signs, including text, photography and artwork are either copyright COLD SNAP STUDIO or copyrighted by a third party and used under license. They MAY NOT be reproduced in any manner, for any reason whatsoever, without our express written permission. Sale or purchase of our signs does not transfer copyright in any way to the customer. DIGITAL PRODUCTS: Digital file sales are for personal use only; they may not be sold, transferred or reproduced in full or in part to create other artworks or products. ALL PRODUCTS and CUSTOM WORK: Sale or purchase of any work — printed, custom or digital — does not transfer copyright in any way to the customer. We retain all rights to all artwork, products and text, including custom artwork. We may use artwork created for a custom order to produce other related products. By making a purchase, you have agreed to our copyright policy. Copyright violators will be subject to prosecution. Note that signs purchased from us may not be resold without a resale contract. Please contact us for details. Thank you. Can you customize my car seat sign? Sorry, we can not customize any signs' wording, size or design for you at this time. All signs are preprinted, assembled, and ready to ship! Therefore, they can not be altered. Thank you. How do I hang my baby's sign? Can you create a sign with Superman, Batman, Minnie Mouse, or other Disney characters? No! Using such characters on handmade products would be copyright and/or trademark infringement, which is against the law. Please be wary of sellers who advertise such products—unless they have a license from companies like Disney (which is very hard and expensive to obtain), they are selling illegally. We respect others' intellectual property rights. As an ethical business, and as artists ourselves, we license art legally, and would never violate U.S. copyright laws. Is using a car seat sign "too much"? IT'S NOT! As parents, our primary responsibility is to protect our children and ensure their well-being. Our signs are polite; they say PLEASE and THANK YOU. Most people do not wash their hands after using the restroom. If people feel a sign is "too much", they are not really thinking about where people's hands go and what they do with them throughout the day! Newborns, infants and preemies have weak immune systems and have trouble regulating their body temperature. Catching a virus (and as a result, developing a fever) can be life-threatening! Remember, your child's health is your top priority, and it comes before what others think. Yes. On Etsy, we ship to the U.S., U.K., Canada and Australia. Car Seat Sign, Don't Touch the Baby, Baby Shower Gift - Funny "Mom Will Give You the Boot" - Blue Boot Baby Tag for Boys - SPECIAL PRICE!!! Baby No Touch Sign - Little Princess, Germs Are Just Unneeded Stress - Tag for Baby Daughter - Don't Touch the Baby Signs - SPECIAL PRICE!! Keep Hands Away, New Baby Stroller and Car Carrier Sign - "Peace Baby" Stroller Tag - Special Price!! !